I sit here in the golden light of evening, wrapped up snug and warm in my duvet. I’m holed up in my room for some quiet writing time, and it feels like bliss. I haven’t been finding enough time for writing – not enough for writing blog posts, anyway, although I’ve been working on a piece for a local publication. When Westley ushers me out of the chaos of boy noise and action and into the sanctum of this quiet space to collect and record my thoughts, I know that he cares. He understands what it means to me to have this time to process feelings, thrash out ideas, and write, write, write. And the thing is, the more I feel cared for by West, the more I feel connected with him. So even though I am here, far from the madding crowd (as it were), and he – bless him – is in the midst of it, our connection is nurtured. This motto, which Ella puts into practice throughout the movie, resonates with me. The necessity of the first part of this counsel is evidenced throughout the trials and challenges of life; if we are to chase dreams, pursue goals, and follow our hearts, we will undoubtedly encounter obstacles along the way. Having the courage to face and overcome those obstacles is key to both success and happiness. Not only that but, although we don’t always realize it, having courage is often a necessary step towards connection with others. It takes courage to approach people we don’t know – even if we imagine that some of them might have the potential to become our friends. It takes courage to show empathy to those outside our immediate sphere. It takes courage to meet people where they’re at (and, for me, that includes having the courage to drive new roads and tackle traffic in unfamiliar areas!). It takes courage to perform, speak, or play in front of people. It takes courage to make ourselves vulnerable in sharing our hearts. But each of these things, if we summon the courage to do them, can lead us into a closer relationship with those around us. That wise young backpacker – she was probably a decade and a half younger than I am now, but she’d got it right. Being courageous doesn’t require us to be fearless; it requires us to do the important thing even when we are afraid. And as for kindness, well, it has been on my heart lately to write about the symbiosis between caring and connection. Everywhere I look, I see the one leading to the other, and it is a beautiful thing. A while back, I heard the story of Tinney Davidson (as depicted here in a Canadian TV news segment). Mrs. Davidson is in her eighties. When her husband retired, the two of them began a habit of waving to the high school students as the teens walked by their living room window en route to and from school each day – and pretty soon many of the students were waving back. Her husband passed away some time ago, but Mrs. Davidson has continued her practice of greeting the students walking by her house. She makes a point of being there to see them. This elderly lady has shown caring, simply by making a point of greeting these kids, and the result has been a connection that runs deeper than either she or the teenagers could have anticipated. Then there’s that Thai life insurance commercial – you know the one? (It’s here if you’ve missed it.) In the video, we see a young man going about his day. On his way to and from work, he performs one small act of kindness after another: he pushes a parched plant under a dripping gutter; he helps a vendor push her unwieldy cart across the road; he shares his lunch with a stray dog; he reaches into his wallet and pulls out one of the few bills within to give to a begging mother-and-daughter; he hangs a small bunch of bananas on an elderly neighbour’s door handle. And at the end of the day, this generous man sits down alone to a simple meal of boiled rice. He is not rich; but we see by the end of the video that he has cultivated relationships with those around him – his wealth is in the connections he has forged through his kindness. And he has made a true difference by caring; the poor beggar-woman has been able to send her daughter to school. It’s such a simple video, and yet it has gone viral – it touches people profoundly. We all need relationship. Oh yes – even introverts. Even if you connect with others and then need to retreat from the world to regain your sense of equilibrium, I’ll bet that, deep down, you still covet connection. I take, as further evidence of this truth, the enthusiasm with which my little gang of boys and I are greeted as we arrive on the path to school. One little boy, who’s accompanied to school by his loving Grandma, leaves her side to make a beeline for our party when he spies us. He hops off his scooter and slows his pace (and ours! ), as if to draw out the time until we arrive at the schoolroom; and he always has something he wants to chat about. He looks up at me, eager to share some little nugget of news or other. Why? He wants connection. His Mama is working in the morning, but he’s still craving that Mama-time – and I’ll do in a pinch. He’s not neglected – no doubt he’s loved and cherished by his parents as much as our boys are loved and cherished by us – but he has a specific need for a mother’s nurture. I recognize it, because my boys have the same need – and that’s why our morning walk and hang-out time before school is so precious to me. If I were working away from home at that time, I’d hope that another Mama would understand their need for reassurance and show them just a little bit of kindness to fortify them for the day ahead. Eye contact, a pat on the shoulder, a listening ear, and an encouraging word as they head into school – it’s a simple thing, but it makes a big difference. Another boy joins us for our walk home. He makes a point of checking in with me and asking us to wait while he fetches his scooter so that he can walk home with us – even though we only go a portion of the way with him. This boy is ten – not yet old enough to be left on his own, and yet (by necessity of his situation) he does spend a lot of time at home alone. He’s mature, worldly (possibly rather too sophisticated for his age), and very self-assured. And yet this child, too, craves connection. He is thirsty for a mother’s attention, because his own Mum has to be at work to provide for him. It is a small kindness to notice the people in our lives who need us to share a bit of ourselves. The old lady whom we see through her window, sitting alone in her living room – or the young teenagers, alternately unsure and cocky, striding along the sidewalk outside our house. A young man who dines alone each night – or the poor woman who’s desperate for the means to allow her daughter to attend school. The little boy who needs a stand-in for his Mummy at the beginning of the day – or the older boy who just wants to connect with a caring adult before he heads home to an empty house. 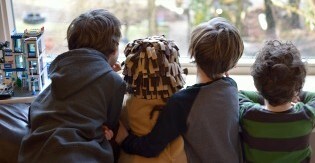 Even my very own boys, clamouring for my attention and trying my last nerves at the end of a busy day. The reward for this caring is connection. Have courage, and be kind. What situation in your life is demanding your courage, your caring, or your kindness? Anyone who reads my blog regularly knows that connection is very important to me. I’ve just set up a new way to connect with my readers, too: if you’re on facebook, head along to my new fb page: [https://www.facebook.com/autocratricks] This is my new way to notify friends of the latest posts and to share more informally with my readers. Thanks in advance for checking it out, and for ‘Liking’ and sharing it! OK, so D. hasn’t been sleeping that well lately. We’re not in the cry-it-out camp – I always figure that there’s something up if they’re bothering to cry about it – so it’s a matter of taking time to do the pat-pat, hush-hush, soothing noises, and top-ups on his warm milk before bed. Last night it took me an hour to get him down. I think it may have to do with the fact that he has begun to realize that the two of us are separate entities – that we can actually be physically apart from one another – a fact that he finds understandably disturbing. I don’t know how long these sleep issues have been going on for – the strange thing about disruptions to their normal sleep patterns is that when you’re going through a rough phase you almost can’t remember the last time bedtime was easy, and when it’s going well it’s hard to remember a time when you struggled. But although it seems to have been going on forever, if I had to hazard a guess I’d say that we’ve been having trouble getting him down at night for a few weeks. Before this (sometime in the distant past, my sleep-deprived mind is insisting), bedtime was a breeze. We had this sweet little routine of pj’s, sleep-sack, soundtrack (crashing waves) on, lights out, cuddly bottle and tooth-brushing – and then we’d kiss his sweet head, pop him down in his cot (in his preferred position: face down, bottom up) with his dummy, and he’d be asleep almost before we’d closed the door. No more. Now it is routinely taking an hour or more to settle D. down for the night. To add insult to injury, some of the time he has also been waking up in the wee hours, ready to party – and it has taken up to an hour of cuddling, extra water/milk, and back-rubs to get him settled back to sleep again. Now, believe me – I have read all the theories about how to (and how not to) deal with night-waking and how to get them down for the night. I know that there are those who will maintain that we are, in providing such nurture and sustenance, in a mire of our own making. So I am not writing this to elicit sympathy – you would be right that we have options; but we choose not to exercise those options. This is not negotiable, in my book. So, if I am not going to allow my baby to ‘cry it out,’ what options have I got? Well, to me the best option (borne through many similar experiences with my three older boys) is to change myself and my attitude to the waking. 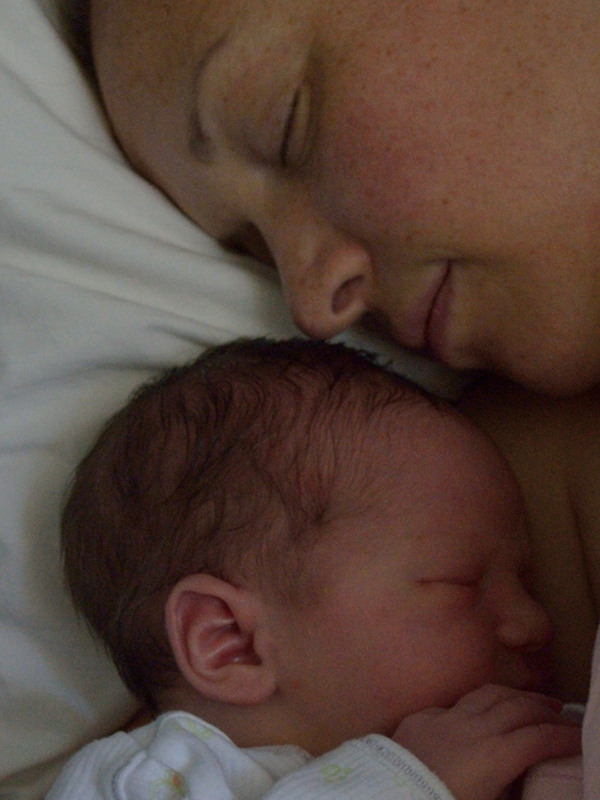 From the first, when I am nursing my newborn, I am making every effort to savour that special one-on-one time together. Do not believe that this means I’m impervious to the toll of sleep deprivation on a person – it is truly torturous! But I choose to believe that it is circumstance and need that dictates the necessity of my presence with my nursling, rather than some capricious demand orchestrated by the child himself. As he gets a bit older, I try to follow his cues about what he needs in the night; sometimes a baby might go through a phase of disturbed sleep because of teeth, or tummy upset, or some subconscious anxiety – the origins of his discomfort might be difficult for me to pinpoint, but that doesn’t negate the fact that he is uncomfortable. And so again, my response is to do what I can to meet his needs as best I can, no matter how inconvenient the timing of his crisis. I try to respond to his need with nurture and love. But that’s all philosophy. What does it look like in practice? That’s the challenge. Luckily, I had lots of time to think about it between 3 and 4AM last night. 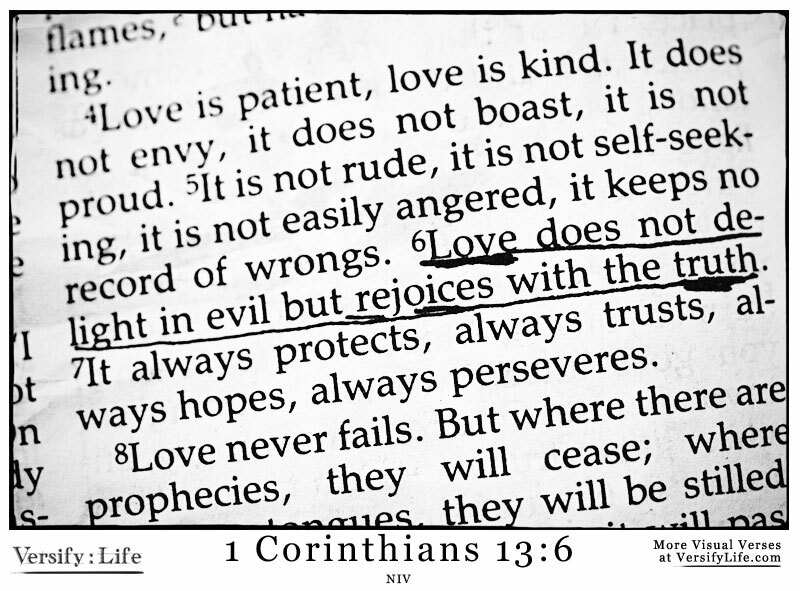 One of the readings at our wedding was the classic Bible verse on love (1 Corinthians 13), and as I struggled with frustration at D.’s wakefulness and exasperation at this ongoing inconvenience (having already spent over an hour putting him to bed in the first place!) I began to wonder, What does love look like at 3AM? This means gently returning him to the prone position over and over again to remind him that it’s sleep time. It means not muttering or growling or gnashing my teeth, even when I’m getting frustrated. It means actively seeking solutions to comfort and soothe my baby. No, “Why can’t you just sleep like X’s baby, and sleep all night? !” – and no bragging about it when he does sleep well. No being arrogant about being the new Baby Whisperer when I luck out and get D. down in less time than it took Westley the previous night. I don’t get a thrill from thinking about how much better a mother I am for doing this pat-pat, shush-shush when others might choose to shut the door and give their babies more time to self-soothe (this means respecting other mothers as they lovingly choose their own paths). I am not up in the night for me – I am up for D.; my needs come second. If West is sleeping too deeply to be aware of the baby’s wakefulness, or if he’s choosing to let me take this watch in the night, I am not going to sigh loudly or bounce back into bed when D.’s settled so that I disturb his sleep (tempting though it may be!). This means taking a deep breath and reminding myself that D. is NOT trying to be malicious by being awake. It means willfully forgetting how long it took to get him down in the first place, and ignoring the urge to count up the number of times he has woken in the night lately. ‘Keeping no record of wrongs’ means that even if I think I’ve mostly been the one getting up in the night, I’m not going to begrudge Westley the extra sleep. I won’t allow myself to wallow in self-pity or anger or other destructive emotions; I will delight in the fact of this precious little person who is in my life, even when he causes pain or inconvenience to me. I won’t lose sight of the fact that this is a temporary problem and I am equipped by Grace to handle it in a loving fashion. What kind of Mamma would I be if I didn’t have that instinct to protect my young at all costs? I am not protecting D. from physical harm as I rock him and kiss him at 3AM – I am offering him the security of my love and the comfort of my presence at a time when he is feeling needy. I am protecting him from unnecessary stress and anxiety. At the same time, I am trusting in my heavenly father for what *I* need; this patience, this kindness, this humility, this perseverance. I am trusting that the dawn will come, and with it a new opportunity to find rest and renewal. I am trusting that my Westley will let me sleep a bit longer when the other boys get up, because he loves and protects me. I am hoping that this little phase won’t last much longer, and I am hopeful that I can continue to rise to the challenge of D.’s sleeplessness with patience and compassion. I will persevere; I won’t give up on helping D. feel safer, more settled, and more at peace. Love has many facets to it. As a visiting pastor recently pointed out in a Sunday sermon, ‘Love Does.’ Love is action; love is intentional. And to me, this is what love looks like at 3AM.